I made this card with paper from the Sweet Stack DCWV -- I just love this cherry paper and think it was my last piece. The cherries and leaf were cut from the Home Decor cart. I cut one bigger than the other so the would nest together better and just stickled the heck out of them! The ribbon is red grograin from SU! I hope to get some scrapping in this weekend, but I do have to clean for Easter company! stickled the hell out of them?, lol. 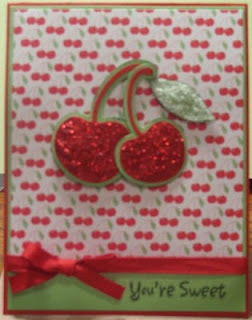 very pretty card, i love those cherries.